Read-out Instrumentation Signpost: Improved growth in British automation market. 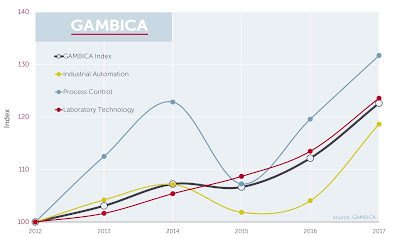 GAMBICA is the Trade Association for Instrumentation, Control, Automation and Laboratory Technology in Britain. 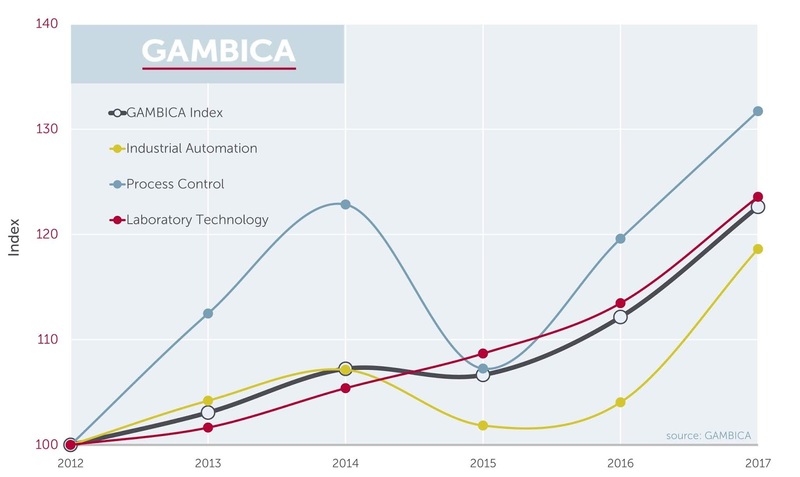 The GAMBICA Index is an indicator of the level of business for Industrial Automation, Process Instrumentation & Control and Laboratory Technology sectors. It shows the levels of all 3 sectors individually and combined, using the 2012 data as a reference point. This sector has continued to recover from the sharp decline in 2015 caused by the oil price crash and the growth this year is significant at over 10%. Expenditure in the oil & gas sector has remained flat with major gains being led by the pharmaceuticals sector followed by the water, waste and food & beverage sectors. Expenditure in the chemical sector has also continued to show steady growth underpinned by a focus on R&D and operational improvements to preserve the Britain’s competitive edge in the global market. This sector saw a growth of 8.9% in 2017, the strongest growth since we started collecting data in 2005. When removing exports from the overall number, there is even stronger growth for the British market alone. The strong growth was consistent across chemicals, services and consumables and particularly notable for equipment. Record growth in 2017, with a 14% improvement on the previous year is reported. This growth puts the sector back to the level it would have been without the 2015 downturn that was largely thought to be due to political and economic uncertainty. Projects that were previously put on hold have now proceeded. The continued relatively weak value of sterling boosting exports of equipment is also a factor in the record growth.